The origin of zombie-ism comes from Haitian Voodoo culture according to the RC theater program. In Haitian the word is "zombi" and means "spirit of the dead." Well this is a school after all; we have to learn somewhere, sometime how to behave at a theater. Now is as good a time as any to learn not to bring food, drinks or water in the Performance Hall. RC's theater's red velvet seats are impeccably clean so every one minded this etiquette reminder. 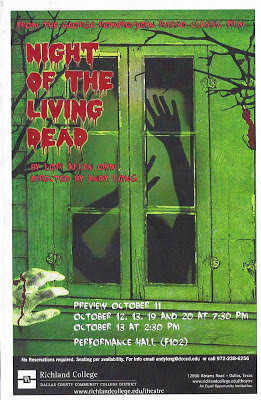 When I attended the NOTLD performance, some people were not minding their manners when they took photographs of the zombie attacks in the play with their cell phones. So let's replace the words "theatre major" with "creative person." Shakespeare wrote that "all the world's a stage" in As You Like It, so let's replace the words "stage," "theater," and "play" with "art or creativity." 1. Improvisation: The great thing about the stage (art, creativity) is that when it's live and you're up in front of an audience anything can, and does happen. Keeping your cool while staying focused and thinking quickly applies to so much of the world. 2. Project management: A stage production is basically a business project. You have teams of people making up one team working to successfully accomplish a task on time. 3. Working with a limited budget: Most plays are produced on limited budgets. This forces you to be imaginative, do more with less and find creative ways to get the results you want without spending money. Ask any corporate manager and they will tell you that this pretty much describes their job. 4. Dealing with very different human beings: A theatrical community is a mash-up of interesting characters. Theatre teachers how to appreciate, understand and effectively communicate with a widely diverse group of human beings. 5. Understanding the human condition: Most people have the mistaken impression that acting is all about pretending and being "fake" in front of others. Good actors learn the human condition intimately through observation and painfully detailed introspection. 6. Doing whatever needs to be done: a theatre major has to learn to do it all. Everything from acting to design to marketing and cleaning up. A theatre major learns quickly to do whatever needs to be done for the good of the production. This translates really well into the business world. 7. Hard work: Theatre requires countless hours of process in order to bring together a production. Theatre majors spend more hours doing and learning than just about any other major on campus. 8. Making difficult choices: Any business person will tell you that difficult decisions must sometimes be made. Theatre majors make them daily, whether it be choosing a scene partner or designing a set, difficult choices abound. 9. Presentation skills: Learning to stand up confidently and deliver a concise, informative and entertaining message is invaluble. Theatre majors work on this a lot. 10. Doing the best you can with what you've got: This one is my favorite reason to be creative. As a theatre major (creative one) you learn quickly that sometimes you don't get the set or costume you initially wanted. You learn to make what you have the best it can be.